Camouflage is not just for men and hunters anymore. More and more brides are choosing camouflage wedding dresses and girls are choosing camouflage prom dresses. And with those camouflage dresses is the need for camouflage shoes! We found the top camouflage shoes for special occasions. Camouflage pumps are the most popular camouflage shoes for special occasions, and top designers are incorporating the design into their collections. 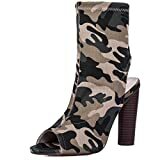 Michael Kors and Aerosoles both make a basic camouflage pump, while Carlos by Carlos Santana steps it up a notch with their zippered camouflage dress pumps. The Carlos by Carlos Santana Women’s Veruca Dress Pumps are borderline booties, and camouflage booties are a huge hit as well! Most camouflage sandals are not as “dressy” as camouflage pumps and camouflage ankle boots. Chinese Laundry makes the sexiest camouflage dress sandal. We’ve definitely decided that camouflage pumps are the winner of the best camouflage shoes for special occasions, whether they be ankle bootie pumps, peeptoe pumps or platform wedge pumps with buckles. So which camouflage shoes are your favorite for a special occasion? You can find Camouflage Shoes for the best price on Amazon.